1-4 include classed needed to draw calculator interface. 5 Delare variable txtresult of JTextField type. 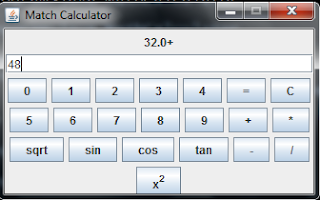 The JTextField txtresult acts as and entry point of the calculator program. 6 Delare variable lblshow of JLabel type. The lblshow label is used to track the result of calcuations. 7 Declare variables: btzero, btone,bttwo,btthree,btfour,btfive,btsix, btseven, bteight, btnine of JButton type. These variables will reference to button labeled 0, labeled 1,labeled 2,labeled 3,labeled 4,labeled 5,labeled 6, labeled 7,labeled 8,labeled 9 on the program interface. 8 Declare variables: btadd, btsubtract, btmultiply, btdivide, btclear, btresult,btsquare, btsqrt,btcos,btsin,bttan. They refer to button labeled +, labeled -, labeled *, labeled /, labeled C, labeled =, labeled x*x, labeled sqrt, labeled sin, labeled cos, and labeled tan on the program interface. 9 Declare variable dialog of JOption pane type. This variable refers to the dialog box to inform the user when an invalid calculation occurs. 10 Declare variable res of Double type to store the result of any calculation. 11-88 Design the program interface. For more detail, you may need to read code explanation of the Text Editor program. 89 To able a button to perform an action when it is clicked, the actionPerformed method of the ActionListener interface has to be rewritten. When a numbering button is clicked the text on the button is appended to text box txtresult. This task can be done by concatenating the existing value of the text box and the text on the clicked button. When a calculation button (addition, subtraction,...) is clicked the calc method is called to perform the calculation. 90 The KeyList class extends KeyAdapter class. The KeyAdpater class has the keyTyped method that can be rewritten to detect key input. Each character key input is converted to its integer number equivalent. Then this number is checked to determine whether it is numerical (between 48 and 57), dot (46), backspace (8), or delete (127) key. The key that is not in the acceptable range is not shown in the text box. However, some hidden keys that are needed such as +,-,*/, and ENTER keys are tracked. These keys can be used to perform operations the same as button +, button -, button *, button /, and button = on the window interface. 91 The calc method defines code to do a calculation. It is invoked when a button to perform the calculation is clicked or when the key to perform the option is typed. 92 The getVal method is invoked to get and convert the number in txtresult text to a double type. 93 The MathCalculator class contain the main method to start the program.